If you are looking for a gift to delight your sweetheart, then this in-line fancy diamond pendant may be just what you have been searching for. Featuring a trio natural fancy yellow colored diamonds totaling 1.78 carat, it includes two princess cut diamonds that drop down to a pear cut diamond � the contrast of shapes provides a captivating detail. 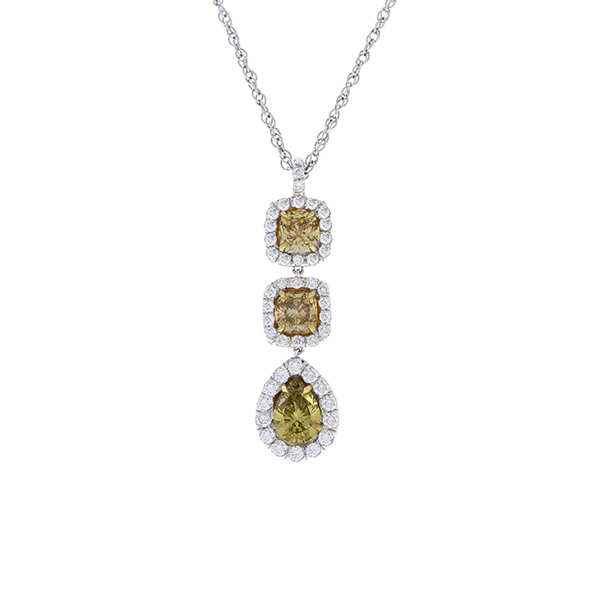 Brilliant white diamonds surround each yellow diamond and add a dazzling detail. Crafted of enduring 18 Karat white gold, this pendant is sure to catch everyone�s eye. This pendant accompanies with a 14K, 18-inch bead chain of your choice of Rose gold, White gold, or Yellow gold.